Our Lions Clubs are shrinking! Please join in the Lions 39W District membership drive and help reverse the trend. Recruit new members! Retain the current members! Revitalize your club! The club with the largest percentage of net growth between March 1st and May 1st will win the Club contest, and the individual Lion who recruits the most new members will win the Lion contest. A new contest this year, the Lions Global Youth Music Competition is underway. In case you haven't heard, Nicole Oswald, granddaughter of Lions Del and Sandy Oswald, members of the Meridian Noon Lions, is Multi District 39's winning violinist. Many of you heard Nicole perform at this year's District 39W convention or at the Sun Valley convention last May. This week, the USA competition heats up on You Tube, where a panel of jurors is judging the musicians. You can hear Nicole and the other contestants on the Lions You Tube Channel or read more about the contest at the Lions International website. Not a fan of Lions39W on Facebook? Not sure what Facebook is? Don't want to join Facebook? That's OK, I resisted for quite a while, too. You can still see the Lions 39W Facebook posts just by coming here to the blog. On the left hand column, scroll down until you see Lions 39W's Facebook Fan Box. There you can see pictures of some of our "fans" and read what's been written on the Facebook page. Just one more way for us to communicate! The annual Patriotism Essay Contest presented by the Lions of District 39 is underway! Students in elementary schools across southern Idaho and eastern Oregon are writing about this year's topic, "Who is my American Hero and Why?" The contest is open to students in 1st through 6th grades and each grade is judged separately. The kids come up with some amazing essays! You can read more about the contest on our website. Check out the article in Sunday's Times News regarding the Winter Camp for the Blind!!! Awesome!!! Way to get the word out Lion Nancy!!! 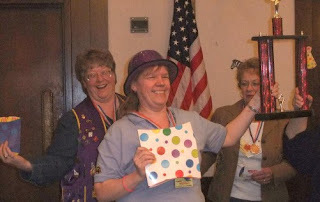 The 2010 Midwinter Convention is now in the books. A lot of work goes into planning the convention- renting the space, planning the menus, arranging speakers and displays, decorating, collecting prizes, setting up, tearing down....Great job, Lions! (Can't begin to name all the people involved-I'd leave someone out, for sure!) Your time and effort is appreciated! Meet new people-Yes, met several people from around the state. See old friends-Yes, saw lots of friends. Network-Yes, talked to many Lions about their clubs. Have fun-Yes, had some laughs. Attend a class-No, didn't do this. Learn something-Yes, learned about Pedia Vision-awesome technology! Eat and drink-Wow, plenty to eat; don't think I need anything today! Vote, if you're a delegate-Yes, did that. Be fun to have some competitions in the future, but those "elected" are great choices. Be motivated-Yes, I'm already forming new ideas which will take shape in the coming weeks. Be inspired-Not sure I was truly inspired, but I'll take being motivated. Win prizes-I didn't win a thing, but was able to buy one of those cute circus wagons from the tables. So I'd say I did pretty well and got most things out of the convention that I expected. You know you can't please all the people all the time, but can these negatives be improved? What are the reasons that other Lions didn't bother to attend at all? Will you go next year? How would you rate the convention? What did you like and what did you not like? Got an opinion? Hit the comment link below! The Lions 39W Midwinter Convention kicked off this evening at the Owyhee Plaza with fun and games, circus style. The Parma Lions, serving as tail twisters, set up an amazing display of raffle prizes and silent auction items. I know I'm going to be trying to win some of the Parma wine with my raffle tickets tomorrow! That's a really big trophy! Following some introductions, we heard a few remarks from Lion Ashley Seymour who is running for 2nd Vice District Governor and from ID Doug Lozier, our special guest this weekend. Then on to some games-juggling, hula hoop, balloon animals, and balloon popping. 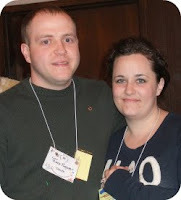 Lion Blake Rodgers and his wife, Sarah, traveled all the way from Declo to win the balloon popping. Blake ran for the balloons and Sarah sat on them. Hope the lottery ticket is a winner! Anyway, when you turn one year old, you have a party! In Lions' terms, we call them "Charter" parties, and BSOLC held theirs on Saturday night. 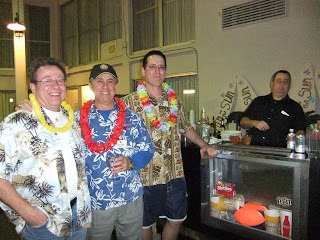 The "Tiki Luau" was held at Holiday Inn where whiffs of chlorine from the pool had to replace salty ocean breezes (Hey, I'm not complaining- it is winter in Idaho and we're a long way from the tropics!). 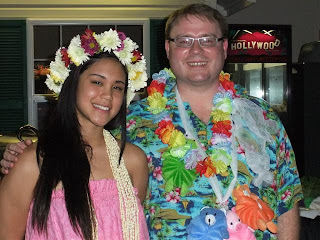 The food was great, the Hawaii shirts were tacky, the leis colorful, the bartender mixed a mean Bahama Mama, and the muumuus-well, they were muumuus. Curt Kelley was the winner (or was that "loser") of the tacky Hawaiian shirt contests-fitting, since Curt thinks all Hawaiian shirts are somewhat tacky. 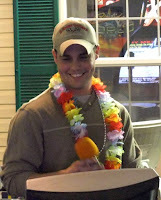 Opey Freedle won the wackiest lei contest-wasn't the contest his idea? I can't begin to mention everything else about the party-suffice it to say, "You shoulda been there!"